Sent to us by a reader: Obviously, it does not relate to Waikanae or Kapiti, but the Dun Mountain is an important national historically significant place as the location of the country’s first railway, the Dun Mountain Railway opened in 1863. 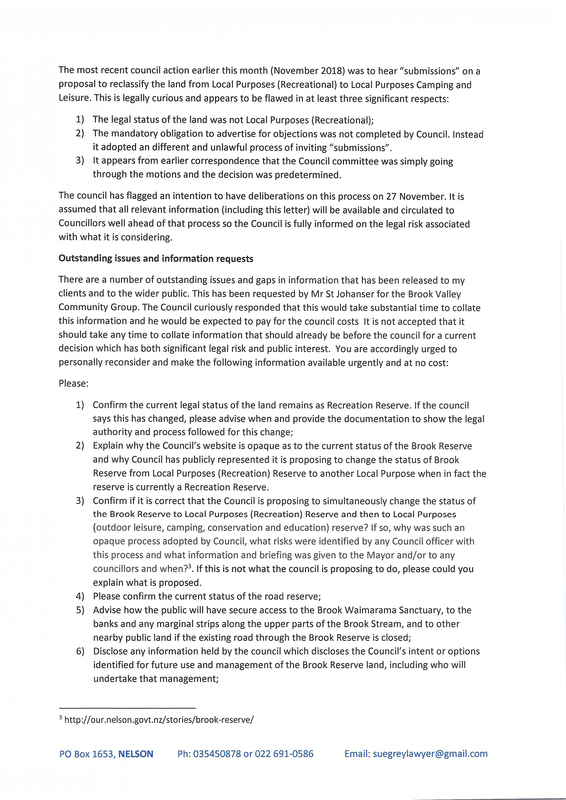 This is a Formal Complaint to the NELSON CITY COUNCIL and Rachel Reece, acting as the Mayor of Nelson, and as the woman, and Patrick Dougherty, acting as the CEO of the Nelson Corporate Council, and as the man, and Alec Louverdis, acting as Group Manager Infrastructure, and as the man, and Tim Skinner, acting as Nelson Chair of Sport and Recreation Committee, and as the man and Stuart Walker, acting as Chair of Works and Infrastructure, and as the man. This Formal Complaint is in regards to the on-going damage and the lack of maintenance being done to the Historic Nelson Dun Mountain Tramway and Trail, that is likely a result of poor management and of not heeding the advice of Geo-tech Professionals or the warnings from the Public of Nelson, who are the rightful owners of the Historic Nelson Dun Mt Tramway, that is currently in trust to the NELSON CITY COUNCIL and representatives thereof. Significant Harm has been done to this publicly owned historic asset via slips caused by the BWST fence and bench being cut in too close and effectively undermining the Historic Dun Mt Tramway, creating significant Liability and a Serious Fidicuary Breach of Public Trust. A suitable Remedy would be for the Council and representatives thereof to use its liability insurance or similar insurance provision to ensure the Historic Dun Mt Tramway is restored to a permanent status and its original width, or ensuring that the trust responsible and also potentially liable- known as the BWST, use their liability insurance or similar provisional funding for the required repair and proper restoration of the Historic Nelson Dun Mountain Tramway. Also required is the competent assessing of the section of the Nelson Historic Dun Mt Tramway from 2nd house down to Betsy Eyre Reserve for maintenance, and performing the required maintenance, and also the installation of the Cawthron Park sign, as promised! — in 1913 when the original Cawthron Park contract was accepted by the Mayor and Councillors of Nelson, this can be confirmed by the NCC historic Council minutes. Also required is the competent assessing of the section of the Nelson Historic Dun Mt Trail in the Upper Maitai Valley that has a slip closing it, this is between the Maitai Reservoir and Smiths Ford area, and performing the required maintenance that will include the removal of the slip and the reinstatement of the trail. More signs highlighting that this Historic Dun Mt Tramway and Trail is a shared Walkway and Trail for both walkers and cyclists is also required for safety reasons. I also require on-going contact in regards to this matter, and a SR number or similar complaint ID from the NCC, and also a timeframe of the required maintenance and repairs to the Nelson Historic Dun Mountain Tramway and Trail both in the Brook and Maitai Valleys. I wish to make formal complaint, both in my own proper person and as Chair of the Brook Valley Community Group Incorporated. Copies of this complaint will be distributed electronically. We prepared objections to proposals presented by Council, and were heard on Thursday 1 November at the chambers. It had already become evident that there was to be no independent chair of the hearing panel of three councilors. This decision was made on the fly by the Mayor at the full Council meeting in September. That decision is the first subject of complaint. This was not the procedure in the previous round of objections to these proposals. No justification has been advanced for the change. The necessity for independence, in at least the chair of a panel hearing objections to a proposal, was amply demonstrated on Thursday. Cr. Fulton, chosen by the panel to chair, fully demonstrated her considerable bias. She is well-known to be committed to the Sanctuary Trust project, the principal if not only beneficiary of the proposed changes in classification of land and road stoppage. She failed to declare her conflict of interest. She, and other panel members appeared to be, astonishingly, entirely ignorant of their proper role in hearing objections under the Reserves Act. In this, they were encouraged by the fact that submissions had been called for publicly, not objections, as was proper, and as was done the last time around. They did not know there to be any difference in law between these terms. This administrative alteration in public notification introduced several new errors. First, it ignored the proper responsibility of the Council as regulatory body to comply with the requirements under sections 23 and 24 of the Reserves Act 1977. It treated the matters under consideration as if they were subject to a process of ordinary submission, say to a Plan, which is not the case. As a result, and secondly, submissions were solicited which were in support of the proposals, including from the Brook Waimarama Sanctuary Trust. These were heard as if they had equal standing at this hearing of objections. Such submissions in support of proposals have in fact no standing at such a hearing. They should not have been solicited and they should not have been heard. In respect of Cr. Fulton’s actions as Chair, thirdly, the decision appeared to encourage her to attempt to reconcile objectors to the proposals. Specifically, I was asked (among others) as to whether it was possible that we might work together in the context of a proposed “Comprehensive Development Plan”, apparently to further an intention to recommend that a division be made between Recreation Reserve land and Local Purposes reserve, to enable the continued expansion of the Sanctuary Trust’s area of leased (and intended management) control. Clearly, it does need to be said that this was and is not the proper function of the chair of a panel formally established for the statutory purpose of hearing objections, having no power of decision, only to recommend. I take personal objection to the expression she employed that she “heard (my) frustration”. It was not her business to remark upon my emotional state. I have no contract with her for counselling. Her patronizing remark arose from a covert intent to minimize and deflect the force of argument presented to the panel, as if this were just another ‘grumpy old man’- a phrase I am told recently employed by the Deputy Mayor- requiring placation by an indulgent mummy. On the contrary, public anger is legitimate, well-founded and further supported by her denial of any unlawfulness in preceding actions of Council, at which to be quite rightly angered. There are in fact prodigious reasons, documented perhaps not fully enough in the extensive submissions made. These reasons remain completely unaddressed by Council. I ask you, once again, and as an example, to consider the fact that the Sanctuary Trust were unlawfully allowed to occupy Recreation Reserve, a fact known to and advised against by your own officers. I take leave to doubt that any member of the panel had made themselves aware of their proper responsibility under the Reserves Act. These are extremely serious matters. The alienation of public land for private purposes and the stopping of public roads are not light subjects for consideration. Our objections were treated politely, but as trivia. This is entirely inappropriate in our representatives on the regulatory body and, equally, unacceptable. There is now a long, long, list of sound reasons for complaint about the actions of the Nelson City Council. As you are perfectly aware, the previous Chief Executive Officer concealed from the elected members, and of course the public who paid her, the opinion of the Environment Court that the Nelson City Council had acted ultra vires in respect of an attempt to reclassify this land as Local Purposes (Recreation). No such classification can exist, and therefore it is not possible for Council now to propose to reclassify from it. This lack of understanding is simple incompetence at best. At worst, fraud. That we have been denied access to this information despite an Official Information request, on the grounds of cost, is a further grave concern. You will find, sir, that there are a great many residents and ratepayers of Nelson who are very angry as to the manner in which public affairs are being conducted. You have staff on your payroll who are cordially and widely detested for the disdain with which they have treated the public and for their many appalling historic and current instances of mismanagement of public assets. This present situation is only one such. It might be that you are able to take some ameliorative action in respect of this travesty of a hearing. I hope so. I am not a litigious man, and as Chair of a community group, I am reluctant to engage us in further actions against the City Council. However, it is my clear responsibility to present an option we may be impelled to take, in the absence of adequate procedures being followed by you to address our concerns. 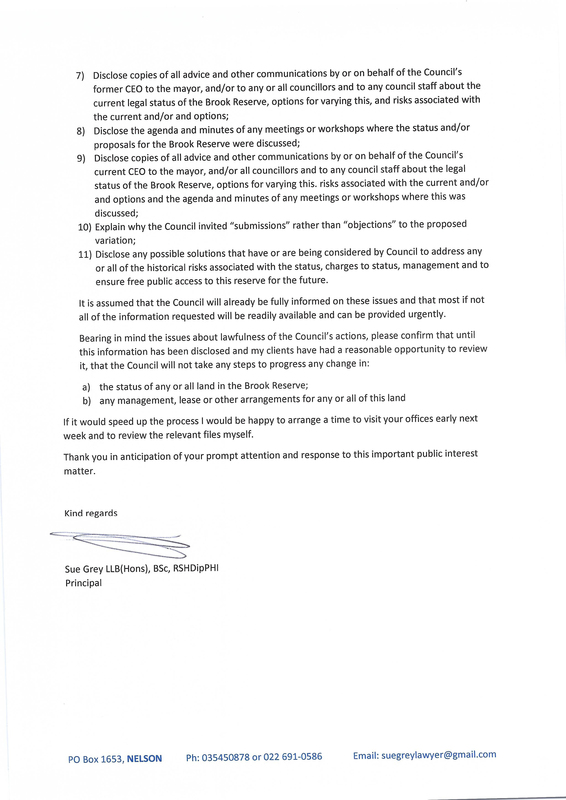 In the event that these proceedings continue with recommendations made to Council that are already signaled to be grossly inadequate, be aware that I intend in my own proper person to institute legal proceedings against the Nelson City Council and yourself as its Chief Executive Officer. I shall ask the Brook Valley Community Group (Incorporated) and others acting as individuals, whether they would wish to join me in such proceedings. Brook Valley Community Group Incorporated. ALERT! Please be advised we have commenced fresh legal action. Here is a letter transmitted today from Sue Grey, together with a pdf document, attached. Distribute widely, please. This has global significance, and that is not hyperbole. 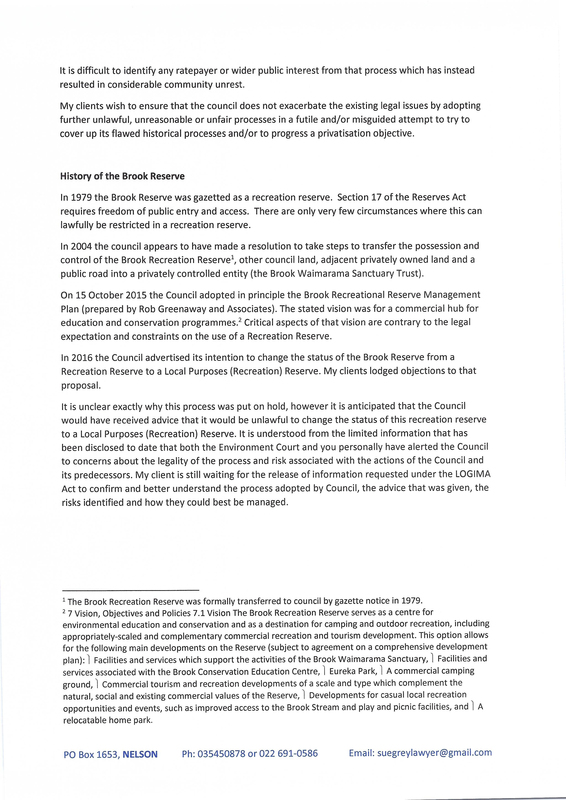 Please find attached urgent correspondence identifying legal concerns and risks and seeking information about the process the Council is currently engaged in seeking to reclassify the legal status of the Brook Reserve. I am happy to provide copies of the relevant extracts from the Reserves Act if that would assist. I would be grateful if you would please acknowledge receipt by reply email and advise when Mr St Johanser and I can expect to receive the requested information and/or a suitable time early next week for me to visit the Council to inspect the relevant files.